It’s true – our mouths are watering at the thought of their golgappas. Dilli Chaat Bhandaar is a small cart in Sadar Bazaar and promises Old Delhi style street food at super affordable prices. Pocket-friendly chaat is kinda Sadar Bazaar’s USP and you’ll know what we mean, if you’ve been. Golgappawallahs by the dozen, good chaat in this market is kinda hit-and-miss. Thankfully, Dilli Chaat Bhandaar’s offerings hit the right spot and transported us to the lanes of Chandni Chowk. Sardar Jalebi is a good landmark, if you go looking for this white chaat cart, but we’re not sure if it’s always at the same place. Aloo chaat, papdi chaat and desi burgers, Dilli Chaat Bhandaar’s menu is painted onto the cart. The chaat fiends that we are, we ordered a plate of the golgappas and the aloo tikkis. The bill? Only INR 50, but everything was flavoursome, hygienic and filling. The golgappas can be made extra tangy or extra sweet, depending on the amount of saunth you like. Ten points for the dahi-doused tikkis – they’re a full meal all on their own. 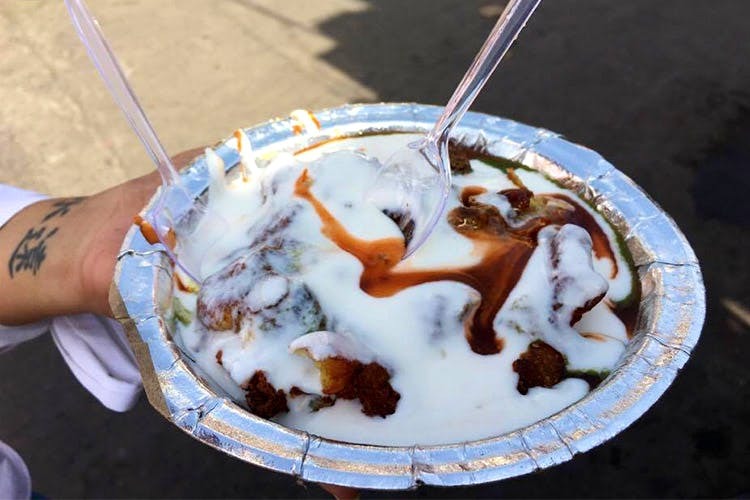 We hadn’t heard of Dilli Chaat Bhandaar before and discovered it quite by chance. If you’re ever that side of town, hungry and low on cash, we’d definitely recommend it.